Heracles and Dionysus compete in a drinking contest. The god reclines on a couch with a drinking-cup in one hand and thyrsos (pine-cone tipped staff) in the other. Beside him, the darkly tanned Heracles quaffs a cup of wine, his club and lion-skin cape resting by his knees. 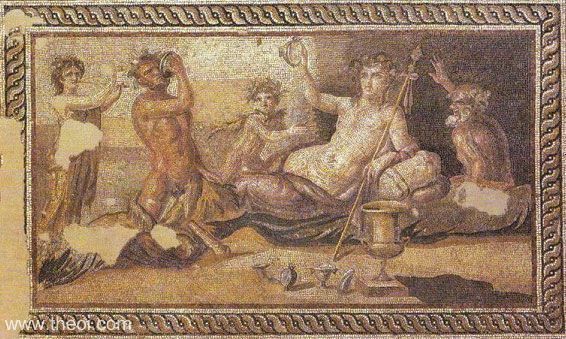 The god is accompanied by a flute-playing Maenad nymph (far left), his cup-bearer, the satyriscus Comus (center), and the elderly satyr Silenus (far right).